When Greenbrier Valley Airport (LWB) opened its new restaurant last fall, the West Virginia airport raised the concessions bar for rural airfields everywhere. The menu at Landings features selections such as arepas, bolitas de mofongo and profiteroles. The refined décor includes custom wood furniture and hand-blown light fixtures. Moreover, LWB manages the restaurant itself rather than hiring an outside operator. In 2015, the airport authority issued a nationwide request for proposals to find a new restaurant concessionaire. The winning bidder, however, backed out and left LWB back at square one. Instead of selecting another candidate, the airport opted to assume management of the restaurant and began a major $460,000 renovation. Kitchen Design/Equipment Supplier: Modern Kitchen Equipment Co.
Snyder personally worked with the contract architect, food equipment supplier and general contractor to modify a set of early design plans. Crews from Agsten Construction, a local contracting company, gutted the restaurant to its bare floors, walls and ceilings. “The walk-in refrigerator was the only thing left behind,” Snyder muses. The new design Agsten constructed incorporated 450 square feet of an adjacent office space. Like most major renovations, LWB’s project included a few unexpected challenges. Removing several layers of old flooring led to the discovery of an adhesive containing asbestos, which required careful abatement. The grease trap was deemed inadequate due to its size and placement, so the airport invested in a new 500-pound underground model. Despite such issues, Sam Hull of Agsten reports that everything from demolition to final painting “fell into place,” and construction was completed last November. Hull attributes this success not only to planning and discussion, but also to Snyder’s passion for the project. “He put his heart and soul into creating Landings,” Hull says. Snyder admits there are times he feels bogged down by the restaurant. Managing it requires a lot of time and energy—and stretches the typical job description of an airport director. Usually, however, he enjoys seeing his vision being realized. To be sure, Snyder considers Landings much more than a restaurant. He sees it as a way to revitalize general aviation traffic by providing “something fun and unexpected” for pilots and passengers flying into and out of LWB. By design, the new restaurant has had a positive impact on the local economy. Artisans and product suppliers throughout Greenbrier Valley benefited from its renovation. A local craftsman created the 10-foot wood doors in the meeting area. The hardwood floors, counters and tabletops were made in the airport industrial park. Custom furniture was crafted locally from freshly harvested West Virginia hickory wood. And the glass bar lights were hand blown by a local artist. Custom steel seating that features the logos of local resorts and tourist attractions helps generate conversations with visitors about what the area has to offer, notes Snyder. Even the restaurant logo has local ties. It includes the image of an aircraft wing from the Airframe and Powerplant mechanic test taken by Snyder’s father in 1961—right down to the FAA inspector’s “Approval” stamp indicating that he passed. The project team developed the idea as a surprise for Snyder while he was away on holiday. 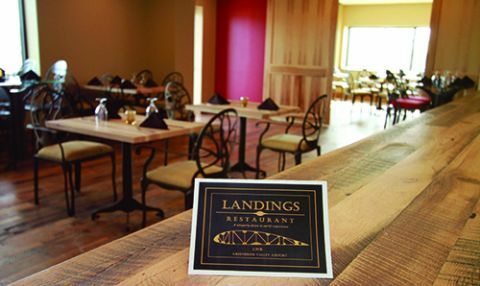 With renovations complete, Landings continues to deliver benefits to the community. The restaurant displays the work of a different local artist every quarter and proudly serves locally roasted Black Dog Coffee. It also provides jobs for between 13 and 15 local residents at any given time. To ensure everyone is successful, servers receive a higher-than-average base rate and are guaranteed to earn $10 per hour, notes Snyder. General Manager Estela Estrada, who is also a classically trained pastry chef, is currently working with the local school system’s Career Tech Education program to train the next generation of chefs for employment at area restaurants such as Landings. Executive chef and assistant manager Melissa Graham notes that the attention to detail evident in the restaurant’s décor also extends into its kitchen. Meats are smoked in-house, and breads and salad dressings are homemade. The menu changes seasonally and features farm-to-table selections made with local ingredients. Crowd favorites include Graham’s smoked trout dip—made with fresh, local fish, of course. The newly renovated kitchen provides a much nicer work environment for the entire staff, she comments. Graham has been with the airport restaurant for 13 years, but she and the rest of the Landings crews only recently became employees of the airport authority. As such, everyone had to undergo drug screenings and federal background checks. “Our entire staff does, indeed, meet very high standards,” says Snyder. The restaurant serves ticketed and non-ticketed passengers alike. And since the renovations, it can also host large gatherings and cater off-site events and corporate flights. Soon, it will provide catering services for commercial flights, as well. In early April, the airport announced new non-stop service to Chicago O’Hare and Dulles International on United Airlines. With the addition of new essential air service flights, passenger traffic has increased significantly, and so has business at Landings. Although the restaurant experienced a lull after closing for a year during renovations and reopening in the middle of winter, Snyder expects its spacious veranda and live outdoor music to draw large crowds as the weather warms.